You are currently browsing the category archive for the ‘Drumcam’ category. Do you want to watch any more of my miscellaneous drumcam footage? If not, don’t watch the video below. That tune was one of my favorites to play from this past summer’s LBD tour. The arrangement leans a little more funk than the studio recording, and the pocket between me, Chris (bass), and Misty (keys) was always fun to sit in. 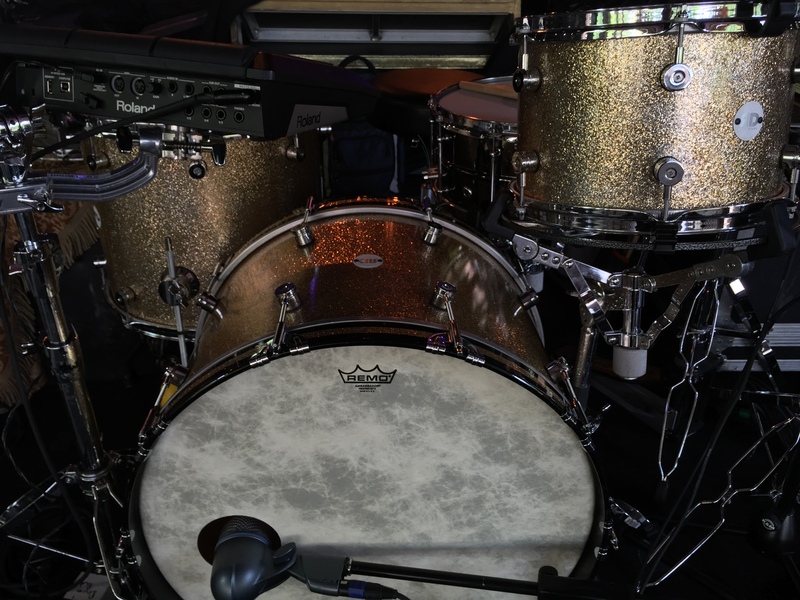 A full gear breakdown can be found here, but specifics for this tune include 16″ hats (Paiste 602 ME crash top and Twenty Series med light bottom) and a 5.5×14 Canopus ash snare. Also, a significant difference between this footage and my previous drumcam vids is the audio source… I didn’t record my in-ear mix this time and instead synced the FOH recording to the GoPro footage. So what you’re hearing is a direct feed of the board mix, which is might sound strange because nobody ever actually hears that. Consider this: the FOH engineer uses the board to send audio signal to the speakers, which then cranks through the room and is accompanied by stage volume, crowd noise, and natural room reverb. 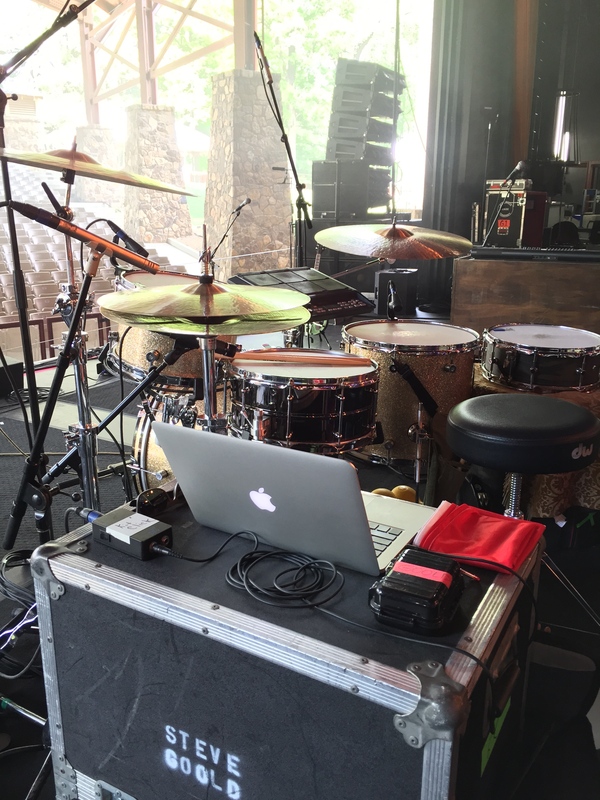 The pro in a board mix is the clean and clear sound – the con is the somewhat unnatural presence of the tones compared to the actual live environment. But I’m not complaining. It’s cool to have the board mixes to listen back to and learn from. And, of course, all hail Bryan Mir, our fearless tour photographer/videographer. He put the GoPro on my rack tom, and captured a ton of other great footage from various shows. Check out his tour documentary montages if you haven’t seen those yet. – I’ve gotten a lot of grief from the other SB band members about how loud I have the click track. It doesn’t seem that loud to me, but I guess I’m used to it. My mix in a live setting like this is always primarily FUNCTIONAL. Of course I’d rather not have the click this loud, but this kind of mix makes it much easier for me to keep my pocket/click relationship where I want it. I also have the tracks pretty loud. – The snare is 7×14 walnut stave shell. I sometimes use this drum with a donut muffler on it, but for this tune there are just a few moongels. it’s tuned pretty low and has more ring than I want it to but with that ring comes the right amount of life. – The SPD has 4 samples that I’m using (the 4 squares toward the rack tom). Clockwise starting top-left they are: verse snare, chorus clap, kick, hats. Interestingly, the chorus clap samples are also programmed, so I’m often hitting the pad sample at the same time that the sample fires in the track. There isn’t a track sample that matches EVERY pad clap that I play, but many of them. 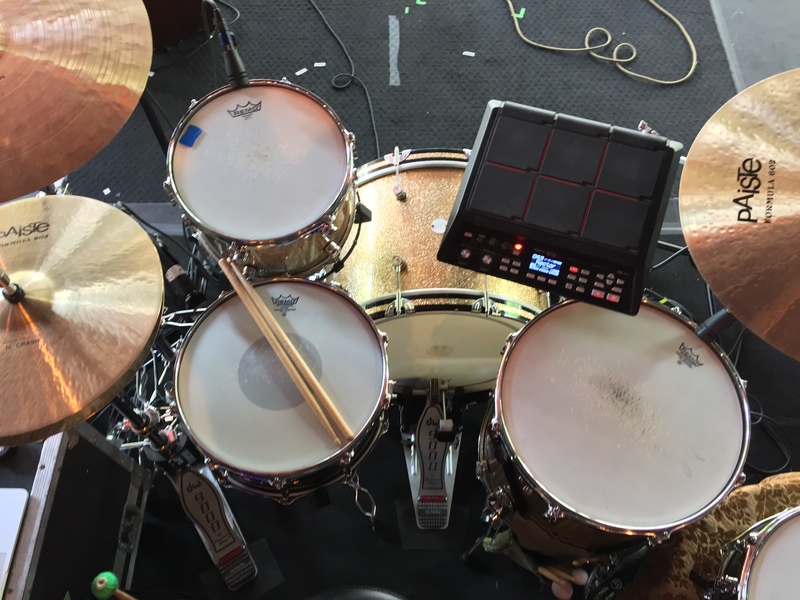 This is because my original plan was to use only organic drums during the choruses and bridge, but then as we got into the tour I figured out how to hit the pad as well. At that point I should have muted the snare sample in the track but I never got around to it. An obvious track snare sample (without me doubling on the pad) happens at 4:07 during my fill back into the final chorus. The tones are also slightly different… the track programming is sharper and the pad sample is almost a clap/snare blend, so I like how they stack together. – Also in the track are some synth pulses (including some busy 32nd notes on the 2nd and final choruses) and some 808 hihat stuff. The hat stuff happens during the choruses and the bridge. I’m doubling a lot of it, but a few hits can be heard by themselves during the bridge. I like the tone of the synthetic hihat but, like the snare samples, I always try to double the rhythms in the track with some sort of visual “real drum set” element. I really like the way my actual hihat and the synthetic hihats blend together during the bridge… the two rhythms aren’t identical and circle around each other in a cool way. – Check out Chris Morrissey delivering some dope sub bass (2:56 – 3:20). Whew. A month ago I posted the opening tune from the fall tour I did with Sara Bareilles, and the response was super encouraging! I’m pumped about everybody’s kind words. Thank you. And so… here’s another one – the closing song of the show. – Her exclamation at 0:15 is because all the fans at the Electric Factory in Philly had brought printouts that said “Brave” on them, and they held them up as soon as the tune started. It was a pretty cool moment. – The Ableton tracks on this tune are just string-based, so all the synthetic drum sounds are samples on the SPD. My main point of focus while playing this song is locking in with the backbeat sample throughout the song. The sample has a 16th note slapback on it, so if I hit the sample at all late or early then the slapback is correspondingly late/early. The whole groove of the song relies on me placing that sample at the proper spot in the pocket. This is most difficult at 2:21 when I bring in the left hand marching pattern. Sometimes I lean against the click a little during this section, but it’s because I’ve learned to key into the sample slapback instead of the click, so as to keep the left hand 16ths locked with the sample. – I have the Brave sequence set up for an undetermined length on the intro. Every night Sara talks over the SPD hook groove and I try to gauge when she’s going to be done and play a rest in order to cue that the verse will start. At this particular show she gave me a nod for the cue (0:48) and it was a little sudden. I would’ve landed that rest a little differently had I not been surprised. Oh well. – Brave, like Chasing the Sun, uses a trash can lid vibe instead of crash sounds in the album version. 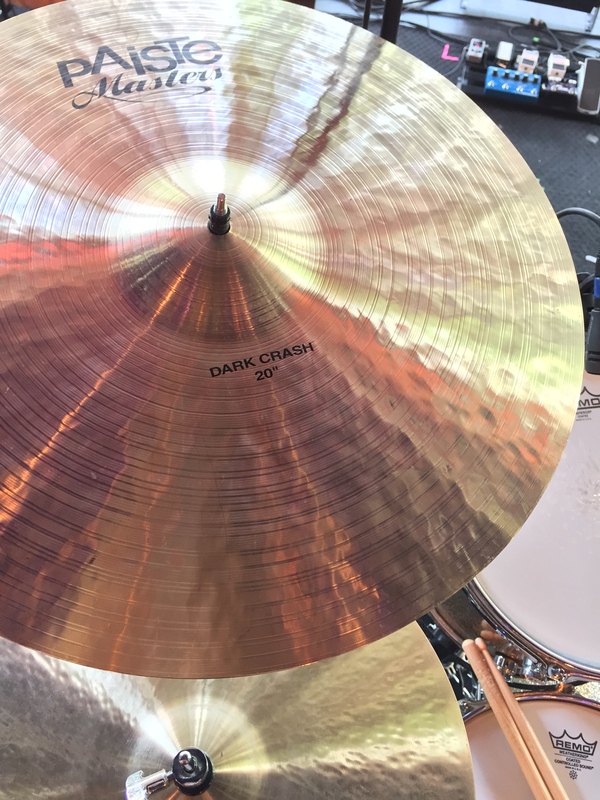 So I’ve got the ride stack happening (21″ Dark Energy over a 22″ Trad light), and the snare tone is my RD 5.5×14 nickel-over-brass with a donut dampening ring.